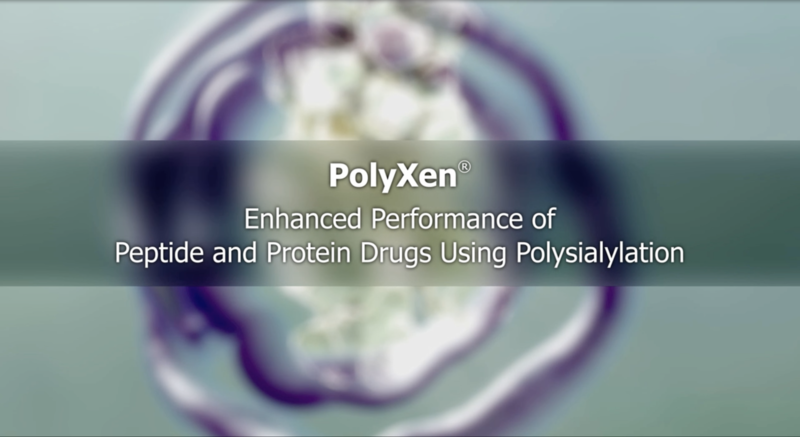 PolyXen is an enabling platform technology for protein drug delivery. It uses the biological polymer polysialic acid (PSA) to prolong the drug's half-life and potentially improve the stability of therapeutic peptides and proteins. Both the site of attachment and the length of the PSA chain can influence the properties of the therapeutic by changing the apparent hydrodynamic radius of the molecule, which in turn, can enhance a number of the biological characteristics of the therapeutic. It can also be used for small molecule drugs. PolyXen has been demonstrated in human clinical trials to confer extended half-life to biotherapeutics such as recombinant human erythropoietin (rhEPO) and recombinant Factor VIII (rFVIII). Polysialic acid (PSA) is a polymer chain comprised of sialic acids linked together. Sialic acid is found on the external membrane of a number of cell types in the body. In addition, it is a natural component expressed on the external membrane on a number of bacterial types. When used for therapeutic protein and peptide drug delivery, PSA provides a protective microenvironment following conjugation to the active drug. This increases the active half-life of the therapeutic drug in the body and allows it to exist largely undetected by the immune system. The PSA polymer is naturally found in the human body. However, PSA evolved initially as part of the coat on the external walls of certain bacteria, which are able to remain largely undetected by the immune system. Our partners are producing PSA from these bacteria in large quantities and with predetermined physical characteristics. Bacterial PSA is an ideal polymer for drug conjugation as it is biodegradable and non-immunogenic, even when coupled to proteins. This is particularly important when a polymer is being used to deliver therapeutics chronically or in large dosages. How does PolyXen technology use PSA? PolyXen uses proprietary techniques to conjugate PSA molecules of appropriate length to specific sites of the therapeutic molecule. The PSA molecules form a glycocalyx (a carbohydrate shield) around the therapeutic molecule, rendering it less exposed to the body's immune system, as well as less exposed to serum proteases and other clearance mechanisms, including renal clearance. Review our key scientific publications/presentations featuring our PolyXen technology.